I’m going to rephrase that to, “Why choose an active or passive DI?” Before we get to that discussion, we should define what a DI or Direct Injection (aka Direct Interface) does. A DI connects high impedance sources to the console. When we have to hook up instruments with high impedance outputs—keyboards, guitars, practically anything with a 1/4” jack—to a mixer, we could just run a long 1/4” cord. But, most of the time, those outputs are unbalanced and, being high impedance, will pick a lot of noise and loose a lot of signal along the way to the console. What a DI does is simultaneously lower the impedance so the signal can travel farther, and balance it so it’s more resistant to noise. A DI works this little bit of magic either through a passive transformer circuit or some active circuitry. With that little bit of theory out of the way, let’s compare the two designs. Passive DI’s require no power to work. Requiring no power is one of the big advantages of passive DIs over active. There is no battery to die, no amplifier to overload and distort; you just plug it in and it works. Unlike active circuitry which can distort when the incoming signal is too hot, a transformer simply saturates somewhat like a tube. This saturation can sound quite pleasant, and often DIs will be chosen for a given application based on how they sound when they saturate. With a passive direct box, it’s also easy to eliminate ground loops caused by DC offsets, or varying voltage potential on the ground pin between the stage and console. A simple ground lift switch safely lifts pin one, breaking the loop. This can be done on active units, but it requires more design and circuitry (and more cost) to keep from loosing phantom power when pin one is lifted. By the way, never use a ground lifting adapter on a power connector. Those so-called “cheater plugs” may stop a ground loop, but also leave the device in question dangerously ungrounded, which could kill someone. Use a DI instead. Active DI’s need power, but can do more. With active circuitry, a designer has the option to do some tone shaping on the signal, or increase the gain before balancing the signal. There are even some clever examples like the Radial JDX which not only captures the signal coming from the guitar head, but also the back electro-magnetic impulse from the loudspeaker. To pull that off, you need active circuitry. 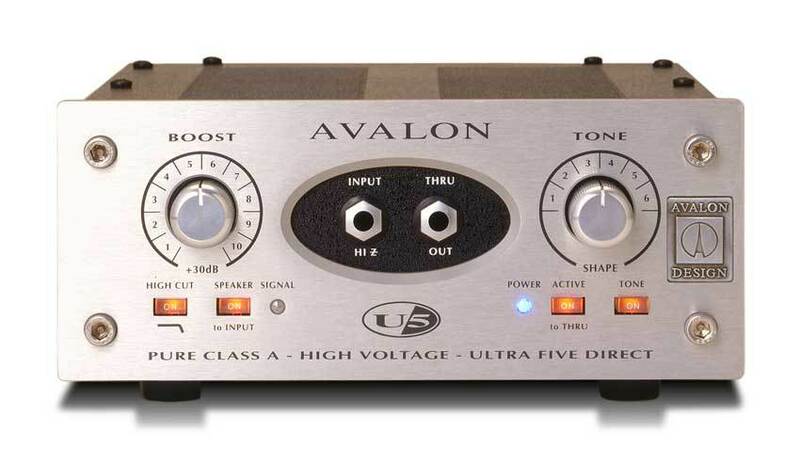 We have a couple Avalon U5 active DIs that even require 120 volts to operate because they are a high voltage Class A design with all kinds of tone shaping possibilities. They sound fantastic and have a price tag to match. Most active DI’s will run from either batteries or phantom power, the later being the preferred choice. Almost all consoles now have phantom, and that provides a much more stable, reliable and powerful source of power for active DI’s. Using a Jensen transformer, this is one of the best passive DIs on the market. About $200. Also using a Jensen transformer, this active DI sets the standard for powered units. A clever box that captures both the direct feed from the amp and the speaker impulse. A more affordable passive DI. The 2 indicates it's a 2 channel version, nice for stereo keyboards. A ProD1 is also available. About $130. A nearly bullet proof, affordable DI, the IMP2 is used on stages worldwide. About $40. The U5 is an Class-A fully discreet active design that sounds amazing. At nearly $600, it's not cheap, but many feel it's worth it. Generally speaking, if the source is active like a keyboard, a passive DI will work great. Passive devices like bass guitars and some acoustic guitars will be better served with an active unit. A specialized pickup like a piezo-electric will need a specially designed, active DI to really maximize the sound. But those are general rules of thumb. Ultimately, it comes down to matching the right tool for the job. If budgets are tight, passive DIs will work just fine. 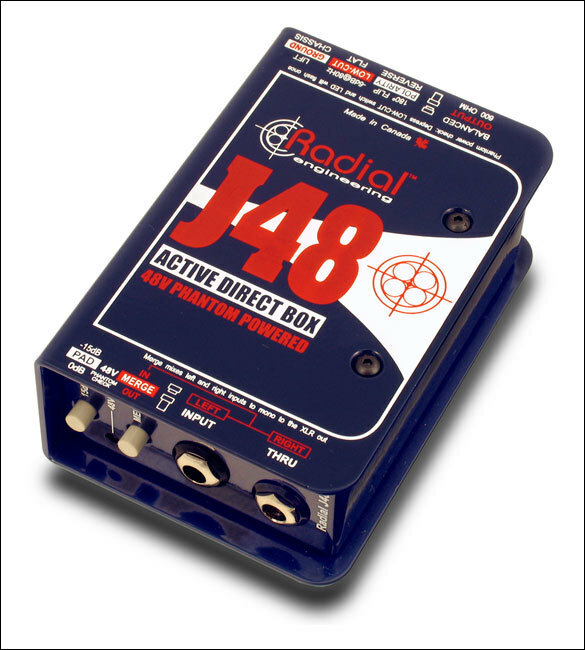 If you can afford a good active DI, like a Radial J48 for example, and it sounds good with your bass or acoustic, then use it. My even more general rule of thumb is that an expensive DI will most often sound better than a cheap DI. Sure, you can find cheap ones under $25, and they will balance an unbalanced signal and give you output. But compared to something a little better (think $50-150), it won’t sound as good. On the other hand, we use a lot of affordable yet very decent DIs (Whirlwind IMP 2’s—about $40) in our student rooms, and they work just fine. 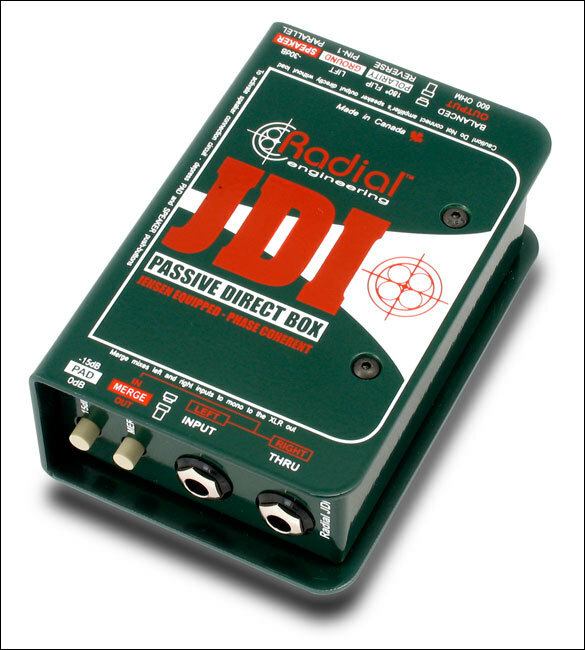 For students playing relatively inexpensive instruments, I’m not sure it makes sense to spend $200 a channel on Radial JDIs. However, on our main stage where we have professional and very serious amateur musicians with instruments that cost more than a good used car, I have no problem spending more. There, we use Radial ProD2s for keyboards, and Avalon U5s for bass and acoustic guitars. The best way to choose one over the other is to listen to them with your source and your PA. Sometimes, differences that show up in a studio just aren’t that apparent in a live sound setting. If all goes well, in an upcoming post, we’re going to pull out some of our DI inventory and I’ll record some tracks and post them here. Stay tuned! Some of the information for this article came from the excellent FAQ section on the Radial website. Spend some time poking around there for more DI education. And by Sennheiser. For more than 60 years, the name Sennheiser has been synonymous with top-quality products and tailor-made complete solutions for every aspect of the recording, transmission and reproduction of sound.